An extremely effective way to make sure that your 5-a-side (or Futsal) team carries an attacking threat is by using a dedicated attacker. This role is one of the most important to your team and, if you get it right, could be the spark that gets you creating space and playing impressive attacking football. 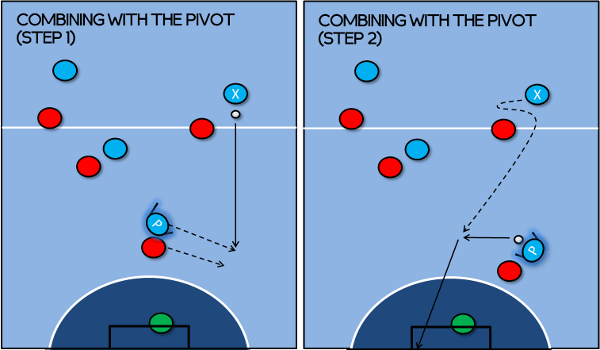 In the Futsal world, the most advanced player on the pitch; the one who is in attack, pinning back the opposition defense is called the Pivot¹. They will be a focal point for the attack, acting as a pivot for the attacking movement of the rest of the team, bringing in their teammates for scoring opportunities through intelligent hold-up play and shrewd lay-offs. If they’re strong and quick with good technique, they will be able to turn ‘or pivot’ around their marker, creating scoring opportunities for themselves. Played well, this position will give the opposition defenders nightmares, keeping them busier and more stressed than Luis Suarez’ dentist. Strength to hold the ball up. That doesn’t necessarily just mean they have to be big, it just means that they must be able to put their foot on the ball and hold it, withstanding the pressure that the defender will put them under. Anticipation both to read when a pass is coming and to latch onto any loose balls for scoring opportunities. Technique to be able to receive a pass, controlling it quickly, and be comfortable with the ball at their feet. It’s also very useful if they’ve got a couple of moves to be able to turn a defender. Speed for turning quickly and for making little darting runs. Shooting accuracy for putting the ball in the net when the chance arises. Even without the ball, the pivot plays an important positional role. By maintaining a position high up the court they pose a continual attacking threat, pinning back a defender giving ‘depth’ to the play. Depth is really important. People often talk about creating space by a team having ‘width’, but you must not overlook ‘depth’. In diagram A the team in blue are attacking upwards, but all of the players are within their own half. Nobody has pushed up at the top and the result is that they team are playing possession in a very cramped space, which makes it hard for them and easier for the opposition. This sort of problem can arise when the attacking players feel they need to move towards the ball, but it’s not always helpful to do that. On the other hand, in diagram B, where a pivot has taken a position high up the court, much more space (the treasured ‘depth’) has opened up for the team to play in. Not only can player A receive the ball and have much more chance to turn the defender, but it also allows the other players space to attack. The additional space created opens up more areas for others to move into, and also more space in which they can play, such as in the one-two (or ‘wall pass’) in the diagram on the right. It might sound easy to receive a pass, but anyone who has played as a pivot will know that any half-decent defender will be breathing down your neck. To deal with this, the pivot needs to get their positioning and body shape right as they receive the ball. In practical terms, this means that they need to receive the ball with their body half-turned. In all the diagrams on this page, you will notice that the pivot is pictured on the half-turn, not turned straight back towards their own goal, but turned sideways. Playing on the half-turn is something that can improve your game in all positions of the pitch. It’s so important that we’ve covered in an article of its own, but it’s especially important to do this when you’re playing as pivot. 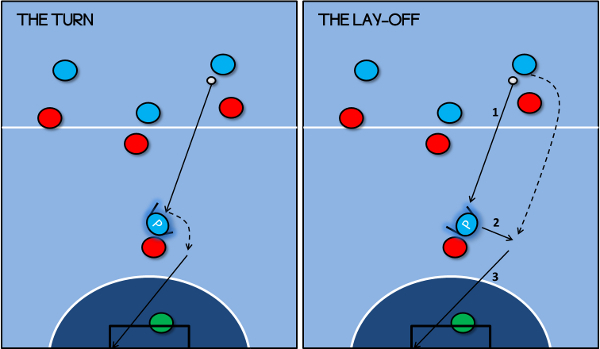 It allows the pivot both to see more (including having more sight of the defender marking them), but also to allow them to hold the opponent off and receive the pass on the foot furthest from the defender (safely out of their reach). 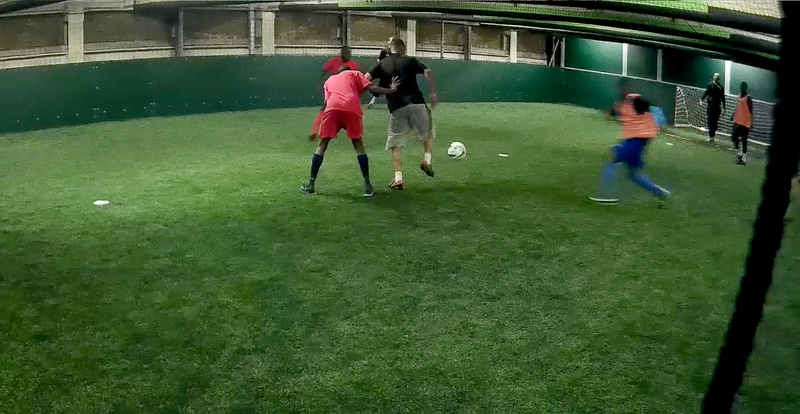 A good first touch is vital – controlling it out of the reach of the defender. This can often be done best by using the sole of the foot – a technique you really need to know for futsal / 5-a-side. Receiving the ball as a pivot requires good technique under pressure. Having received the ball, the pivot is going to have to use all their strength and cunning to keep the defender stealing it. Now, if the defender gets their positioning wrong – by being too much either side of they player, or getting too tight, that would be the time to try to turn. Some pivots will tell you that the moment they try to turn is when they feel the defender’s arm on them – as that’s usually an indication that the defender has just planted themselves in a position. Experiment with this, try turning both ways round opponents and see what works for you. Often, rather than turn, it can be more appropriate to look to lay the ball off with a pass to a teammate who is making the run forward. The diagrams below illustrate an example of this (note that the team in blue are now attacking downwards). 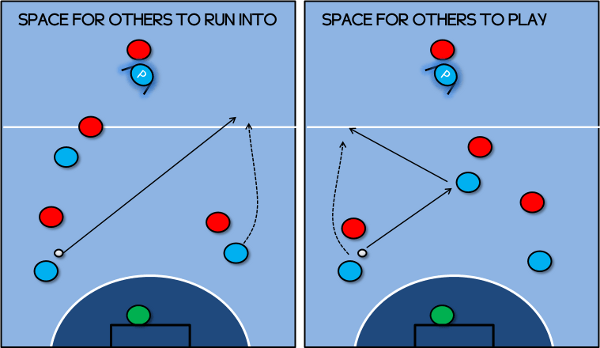 In the above diagram on the right, the teammate has passed the ball into the pivot and then managed to run past their marker. In this instance the pivot, having received the ball, can perform a lay-off (in this case it might be a case of rolling the ball behind them into the teammates path) to set them up for a shot. Even the best pivots will struggle to do it all alone. They will need support from the rest of the team, but the two things they will thank you for the most are: playing them quality passes and making good runs. The quality of the pass you give to the pivot is important. They want to receive a pass that is easy to control (that means that it should be accurate, not over hit, and not bouncing). The rest of the team need to back the pivot by making good supporting runs. In fact, if your pivot can hold the ball up easily then you can cause havoc with supporting runs. Here the pivot has run into the channel to receive a pass from teammate X (yes a pivot doesn’t have to be glued to a central location). As soon as X has made the pass, they fake one way to confuse the marker, before looping round and making a run directly into the space that has been vacated by the pivot. The pivot simply pops the ball into the path of X who has a clear shot at goal. Now that you understand the basics, it’s time to move on and check out videos of pivots in action. Done right, we think that the pivot can be a lethal weapon against other teams. Do you agree? What has been your experience of using a pivot? Are there any strategies for using them that work for you? Let us know your thoughts in the comments below. 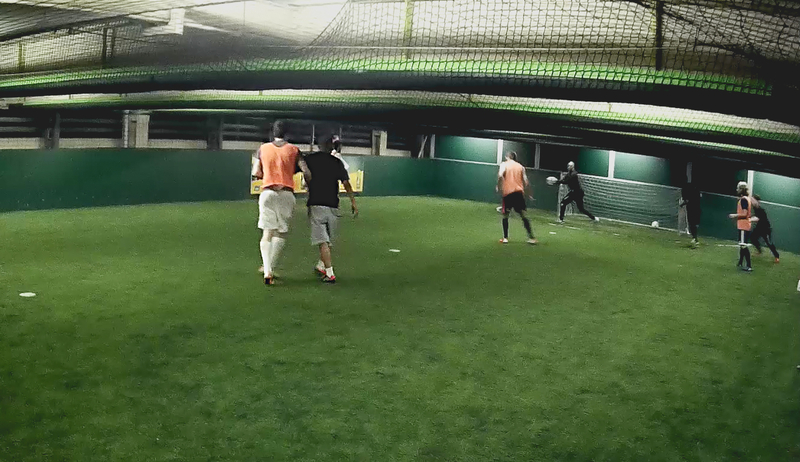 This article has been written by 5-a-side.com in association with Mitre Star. 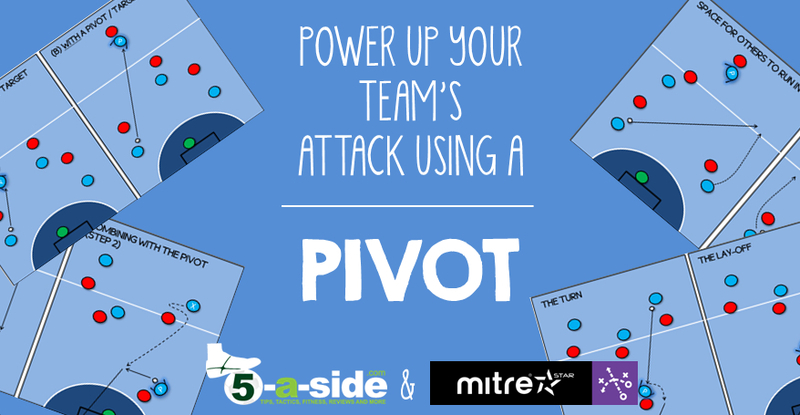 It’s just one of our articles that appear on Mitre’s helpful 5-a-side hub. 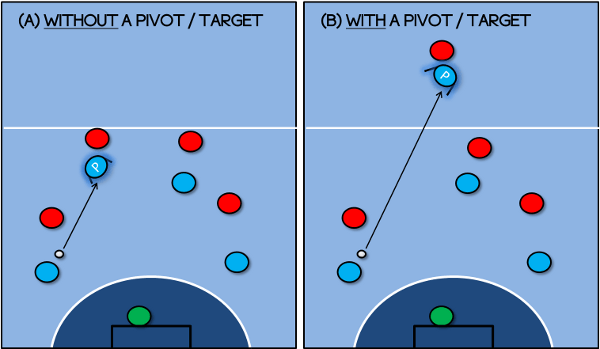 1 = Note that in Australia the ‘Pivot’ can sometimes be used to refer to the defender that stays at the back, whilst the term ‘Target’ is used for the dedicated striker. The Australians are pretty much the only ones that use the term this way – in Brazil, Spain etc, the term ‘pivot’ is used (in Spanish ‘pívot’, in Italian ‘pivot’ and in Portuguese ‘pivô’).